The global ethoxyquin market is competitive in nature. Most of the companies are relying on advancements in technology and innovation in order to expand their business and acquire more shares in the market. In the years to come, it is anticipated that players within the market will strive towards setting up their units in emerging economies, says Transparency Market Research (TMR) in its new report. Players are expected to achieve this by actively participating in mergers and acquisitions, partnerships, collaborations, and similar other tactics. Leading players within the market are: Jiangsu Zhongdan Group, Rensin Chemicals, Skystone Feed Co., and Impextraco, Kemin Industries. According to TMR, the global opportunity in the ethoxyquin market will be US$255.0 mn by 2025. In the period from 2017 to 2025, this market is expected to expand at a 4.5% CAGR. Among different products, ethoxyquin-95 oil is witnessing a comparatively higher demand on account of the rising demand for fish meal worldwide. Increase in the consumption of shrimps and fish among people will fuel the growth of the ethoxyquin-95 oil market. This rain is expected to continue for the rest of the forecast period. On the basis of application it is expected that the demand for ethoxyquin is highest from the aquaculture industry. This is mainly due to the increasing demand for fish and fish meal products in developing nations. 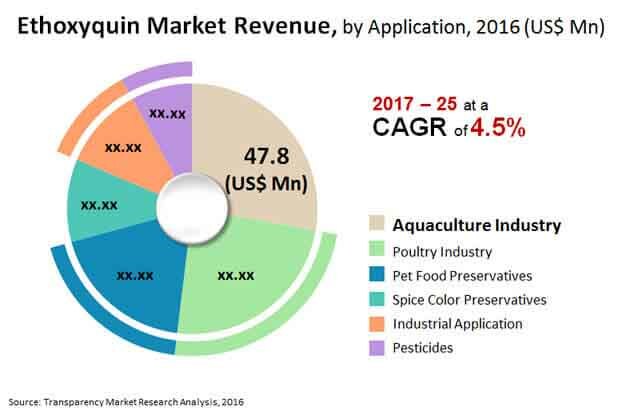 Apart from the aquaculture industry, it is expected that the poultry industry will also generate a considerable demand for ethoxyquin in the coming years on account of the rising consumption of poultry. On the basis of geography, North America led the market in 2016 and is expected to continue to do so in the years to come. The approval for the use of ethoxyquin in animal feed by the FDA has propelled the use of this product in North America. Europe and Asia Pacific are other well-established markets for ethoxyquin. With increasing use of ethoxyquin 66 powder, Asia Pacific will emerge as a lucrative market for ethoxyquin. However, Europe is expected to witness a considerable decline in its shares in the market on account of the government regulations pertaining to the use of ethoxyquin. Ethoxyquin has many applications within the pet food preservatives, poultry industry, spice colour preservatives, aquaculture industry, and industrial applications, which is boosting the growth of the market. A significant rise in the trend of pet adoption will have a positive impact on the market for ethoxyquin. As ethoxyquin is an extremely efficient preservative, helping the slowing down of oxidation of vitamin A, vitamin E, carotene, and xanthophyll in food products for pets, it is being used extensively in these products for prolonging the shelf life of the same. For the very same reason, ethoxyquin is also used extensively for the preservation of fish meals and poultry. Thus, the demand for ethoxyquin is growing. This market is expected to witness a positive growth even in the years to come on account of the phenomenal growth of food trade between countries all over the world. On the downside however, the growing awareness regarding the toxicity of ethoxyquin is expected to dampen the growth of this market. "The implementation of strict regulations regarding the use of chemicals in pet food will also hamper the growth of the ethoxyquin market," said a TMR analyst.